Set your music free with a MusicCast amplifier | What Hi-Fi? Chin-stroking hi-fi buffs once claimed that, while AV amplifiers were all well and good when it came to crash-bang movie soundtracks, they couldn't convey music worth a damn. All that extra signal processing, video switching and multiple channels of amplification means corners needed cutting when it comes to pure sound quality, right? Yamaha never subscribed to that school of thought, which is why its home cinema amps have always proudly carried the 'Natural Sound' badge. It's no idle claim: from the start, Yamaha's audio products have been all about the company's slogan of 'Creating Kando Together. We could fill this entire page with an exploration of the true meaning of the Japanese word 'kando,' but suffice to say it conveys a sense of inspiration, emotion and heartfelt experiences. With its current range of network-enabled amplifiers and receivers, Yamaha puts users in touch with a whole world of entertainment – not just through personal collections of Blu-rays, CDs and network-stored music files but via access to online music. What's more, whatever you're enjoying can be shared with the whole house thanks to integrated MusicCast wireless multi-room. This enables your living room network amplifier to share music to almost 40 other MusicCast products – from speakers to amps and soundbars – that you can place wherever you want. It's all controllable with a simple, intuitive app on a phone or tablet, or even just your voice (hello, Alexa integration!). How do you venture into this wider world of music? Well, you need a Yamaha network receiver, of course, plus a network – if you have home broadband and a Wi-Fi router or hub, like more than 80% of British homes, you're sorted. Yamaha offers both stereo network receivers and multichannel home cinema versions, so you can choose whether you want a system that's as striking with a Dolby Atmos soundtrack as it is soothing with your favourite tunes, or go for a model focussed purely on music. Connected using an Ethernet cable or Wi-Fi, these receivers let you play music stored anywhere on your home network – for example on a computer or a dedicated Network Attached Storage device – as well as stream music from your smartphone or tablet using Bluetooth or AirPlay. They can access thousands of Internet radio stations too, from UK-based BBC and independent broadcasts to services from far-flung corners of the world. Also on tap are the millions-strong music libraries from services including Deezer, Spotify and Tidal, so almost anything you'd want to hear is at your fingertips. The simplest Yamaha network receiver is the stereo R-N303D, which combines the quality of the company's hi-fi engineering with network capabilities. As well as accessing network services, it handles hi-res music all the way up to double DSD, and comes with a built-in DAB/DAB+ radio tuner, as well as offering digital and coaxial inputs. And of course, MusicCast is on board as standard for multi-room music streaming. 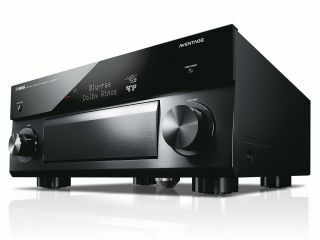 Almost all of Yamaha's AV receivers have network capability, from the entry-level RX-V483 all the way up to the mighty RX-A3070 Aventage flagship model. In every case the same superb performance, plus the simplicity of accessing network music sources and sharing your music with MusicCast, is maintained. Yamaha network receivers don't just broaden your musical horizons, they fill your entire home with your favourite tunes.